Religious Education at Birkdale Primary School. To prepare our children for a life in which they will have multi-cultural tolerance and understanding. We would like to update you on the current work we are doing at Birkdale Primary School in our R.E. lessons. Religious education is a component of the basic curriculum, taught alongside the National Curriculum. It is taught according to a locally agreed syllabus which provides the legal guidance for the teaching and learning of R.E.The current guidance for 'Religious Education for Sefton' was introduced in September 2017. It outlines what subjects are taught in each year group, and the teachers plan a religious education programme based on this guidance. Everything that the children are taught is followed by an opportunity for them to reflect on their learning and contribute their own personal response. Prepare them for a life in which they will have multi-cultural tolerance and understanding. The teaching and learning of Religious Education in the Foundation Stage is seen as ‘INTRODUCING’. Children may begin to explore the world of religion in terms of special people, books, times, places and objects and by visiting places of worship. They listen to and talk about stories. They are introduced to religious words where appropriate and use their senses in exploring religions and beliefs, practices and forms of expression. They reflect on their own feelings and experiences. They use their imagination and curiosity to develop their appreciation and wonder of the world in which they live. Children use some stories from religious traditions as a stimulus to reflect on their own feelings and experiences and explore them in various ways. Using a story as a stimulus, children reflect on the words and actions of characters and decide what they would have done in a similar situation. They learn about the story and its meanings through activity and play. Using role-play as a stimulus, children talk about some of the ways that people show love and concern for others and why this is important. Children think about issues of right and wrong and how humans help one another. Children have opportunities to respond creatively, imaginatively and meaningfully to memorable experiences. Using a religious celebration as a stimulus, children talk about special events associated with the celebration. Through artefacts, stores and music, children learn about important religious celebrations. Children ask and answer questions about religion and culture, as they occur naturally within their everyday experiences. Children visit places of worship. They listen to and respond to a wide range of religious and ethnic groups. They handle artefacts with curiosity and respect. Using religious artefacts as a stimulus, children think about and express meanings associated with the artefact. Children share their own experiences and feelings and those of others, and are supported in reflecting on them. During the Key Stage, pupils will be taught the knowledge, skills and understanding through Christianity and Judaism. The teaching and learning of RE at KS2 is seen as ‘CONNECTING’. 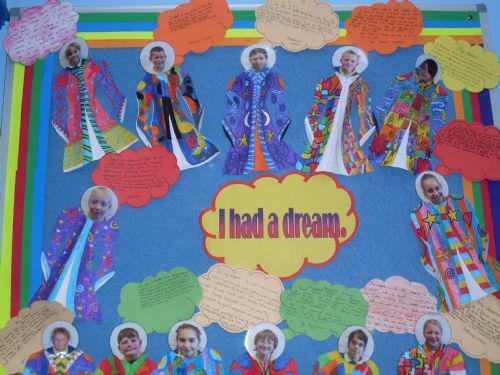 Throughout Key Stage Two, pupils continue to learn about Christianity and Judaism together with an introduction to Hinduism and Islam, recognising the impact of religion and belief locally, nationally and globally. They make connections between differing aspects of religion and consider he different forms of religious expression. They consider the beliefs, teachings, practices and ways of life central to religion. They learn about sacred texts and other sources and consider their meanings. They begin to recognise diversity in religion, learning about similarities and differences both within and between religions and beliefs ad the importance of dialogue between them. They extend the range and use of specialist vocabulary. They recognise the challenges involved in distinguishing between ideas of right and wrong, and valuing what is good and true. They communicate their ideas, recognising other people’s viewpoints. They consider their own beliefs and values and those of others in the light of their learning in religious education. use and interpret information about religion from a range of sources. discuss their own and others’ views of religious truth and belief, expressing their own ideas. During the key stage, pupils will be taught to respect the knowledge, skills and understanding through Christianity, Judaism, an introduction to Hinduism and an introduction to Islam. a. Special people, books, times, places and objects. b. Listen to and talk about stories. c. Religious words, expressions of feelings. a. An introduction to Christianity. b. An introduction to Judaism. c. Stories and festivals from other principal world religions may also be introduced at the teacher's discretion. a. Continued study of Christianity. b. Continued study of Judaism. c. An introduction to Hinduism. d. An introduction to Islam. e. Stories and festivals from other religious traditions may also be included at the teacher's discretion. The topics below will be studied throughout the year, although the order may be changed at the class teacher's discretion if they complement other subjects being studied. 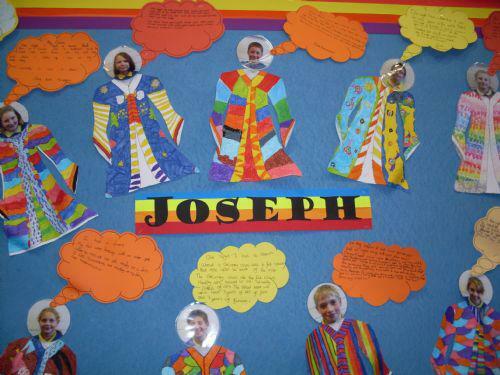 Our work around school regularly displays the work we undertake in RE, studying world faiths.